Eskimo-3 Little Cubs Kids Formula Omega 3 Fish Oil is a pure, natural, essential fatty acid supplement for children up to the age of 12. Contains antioxidants to protect its stability and it comes in a two natural flavours that kids will love. The fish oil used in Eskimo-3 Little Cubs is from sustainable sources of fresh, deep sea fish and not from cultivated fish. The oil in Eskimo-3 Little Cubs has been purified to reduce environmental toxins such as mercury and pesticides, PCBs and DDT, to well below the current acceptable levels. This has been confirmed in independent studies. Available in two delicious natural flavours tutti-frutti (from orange, raspberry, lemon and cherry oils), and orange. Both flavours available in 105ml or 210ml. Natural fish oil, natural rapeseed oil, flavouring: orange flavouring, antioxudant blend (Pufanox) (lecithin, soy), vitamin E (alpha tocopherol, antioxidants: tocopherol-rich extract, extract of rosemary ascorbyl palmitate), vitamin D (cholecalciferol). Once opened, the product is best kept refrigerated and used within 2 months. This is a food supplement and should not be used as a substitute for a varied diet and healthy lifestyle. 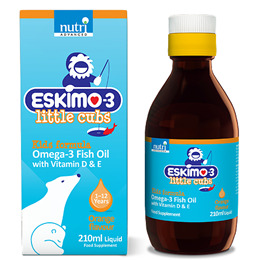 Below are reviews of Eskimo-3 Little Cubs Kids Omega 3 Fish Oil-210ml Liquid by bodykind customers. If you have tried this product we'd love to hear what you think so please leave a review. My daughter likes this flavour the best out of the Eskimo range. high quality children's fish oil shame they no longer do the smaller size in this flavour.